When time came to go to the party I realized that all the activities of that day had made me feel quite unwell and not good company for the party, so I stayed home. By the middle of the evening I decided to just do the dipping and get it over with so I could go to bed and hopefully rejuvenate overnight. The plan was to dip the coconut cream hearts, some mini Oreos, and also to try making a version of Twix candy. The Twix idea came to me when I saw a video on making your own Twix. It was simply a matter of buying some vanilla wafer cookies then dipping them. 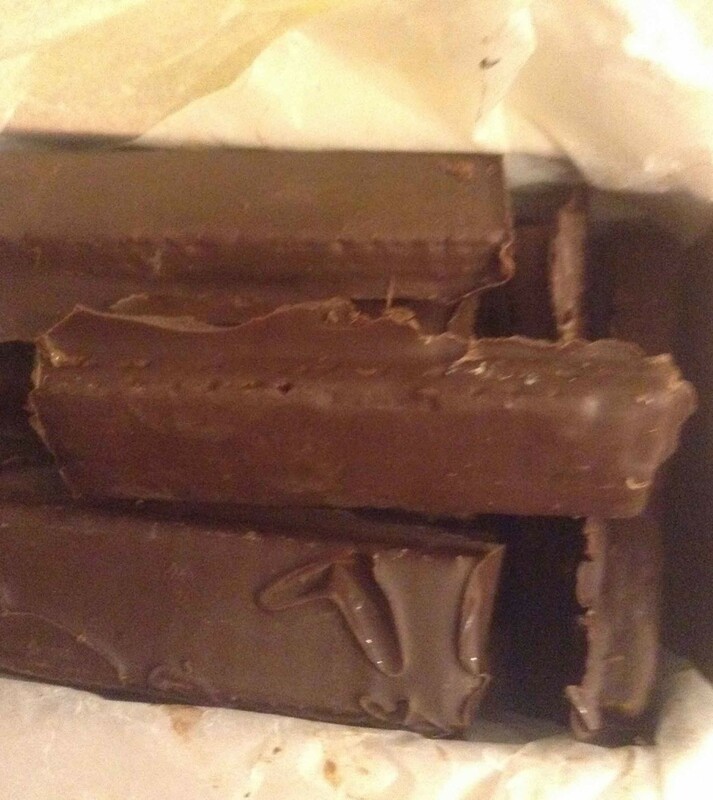 I like Twix so I made a batch. They worked, PLUS they tasted better than the ones from the store…probably because I used Guittard chocolate thinned with a little coconut oil. To make the dipping chocolate, place 2 cups Guittard 60 % cacao chocolate morsels in a medium-sized glass bowl with 3 Tablespoons coconut oil. Put in the microwave oven on the melt option for 30 seconds. Remove from oven and stir. The chips will not be melted yet but remove and stir anyway. Return to oven for 30-second increments, removing and stirring after each time in the oven, until the chocolate is mostly melted. On the final removal, set the bowl on your work surface and continue stirring until all the final bits of chocolate are melted and completely smooth. Drop one vanilla wafer at a time into the melted chocolate. Using one or two forks to operate on the cookie, turn the wafer over until completely covered then drag up the side of the bowl and allow the excess chocolate to drip off into the bowl then place the Twix onto a parchment- or waxed paper-covered cookie sheet to harden. Do NOT use a foil covered sheet. For some reason the chocolate does not want to release from the aluminum foil cleanly. Previous Previous post: Pancakes with Only Two Ingredients!